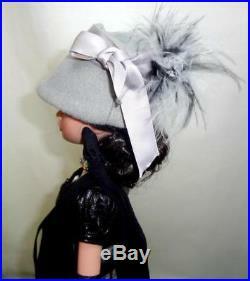 Midnight Silver Steampunk Ellowyne Wilde Tonner 16 Doll in OOAK Fashion Outfit. Wilde Imagination Ellowyne Wilde Collection OOAK Steampunk Ellowyne Wilde 16 Fashion Doll. Condition: Pre-owned, in EXCELLENT condition. 2014 Just in Time Ellowyne Wilde dressed fashion doll from. Has been re-dressed in a OOAK steampunk fashion ensemble. Made of fine quality vinyl and hard plastic with numerous points of articulation for fun posing, Ellowyne has inset blue eyes behind thick lashes and full-rooted mane of mink hair. Her One-of-a-kind steampunk ensemble includes. Fancy black corset from 2005 Basic Wicked Witch 16 doll by. 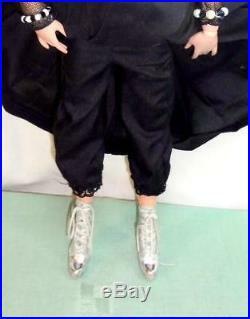 Black pantaloons from 2005 Basic Wicked Witch 16 doll by. Black full-length skirt with attached gray pinstripe overskirt. Matching gray-pinstripe and black laced corset decorated with framed jewel. Lined black gauntlets from Black as Night Parnilla Ghastly 19 doll by. Black leather belt with silver buckle and attached steampunk charms including silver scissors, antique gold pocketwatch, copper telephone, and antique gold skeleton key. Black shiny pleather short jacket with puffy sleeves, black tie ribbon, and attached silver cross charm with dangling chains with jeweled charms. Black chiffon neck tie decorated with jewels. Silver-gray hat decorated with silver satin ribbon, silver satin roses, and silver, white, & black feathers. Metallic silver lace-up Victorian style boots. Beaded black and white stretch bracelet. White pearl and various black faceted beaded stretch bracelet. Reddy Giftware is dedicated to providing high quality service to our customers. Reddy Giftware is always willing to work with our customers to find a mutually beneficial solution when problems arise. Special exceptions to our policies, while not guaranteed, are likely to be granted if a customer communicates openly and honestly with us. We encourage you to look through our online stores for other items you may be interested in purchasing. Your modified invoice will include a comment indicating exactly what has been discounted. Please pay only the invoices with these comments to receive your discount. All sales are final. We will do our best to list as accurately as possible condition and contents of items up for sale. As an online provider of unique gifts, cultural items, and novelties from around the world, Reddy Giftware hopes to inspire an appreciation for cultural diversity and a passion for travel and discovery in the next generation. Imagine the empowerment this song provided to young ladies 3 decades ago. We highly encourage young ladies and men alike to take pride in their gender, stand fast in their beliefs, and never doubt their abilities to achieve. Get images that make Supersized seem small. Tailor your auctions with Auctiva’s. Track Page Views With. Auctiva’s FREE Counter. The item “Midnight Silver Steampunk Ellowyne Wilde Tonner 16 Doll in OOAK Fashion Outfit” is in sale since Monday, June 18, 2018. This item is in the category “Dolls & Bears\Dolls\By Brand, Company, Character\Tonner\Ellowyne Wilde”. The seller is “scifieve” and is located in San Antonio, Texas. This item can be shipped worldwide. 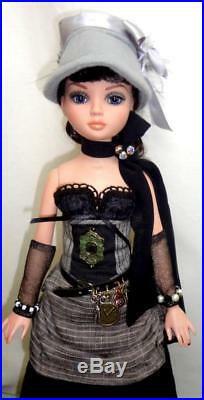 Midnight Silver Steampunk Ellowyne Wilde Tonner 16 Doll in OOAK Fashion Outfit. Wilde Imagination Ellowyne Wilde Collection OOAK Steampunk Ellowyne Wilde 16 Fashion Doll. Condition: Pre-owned, in EXCELLENT condition. 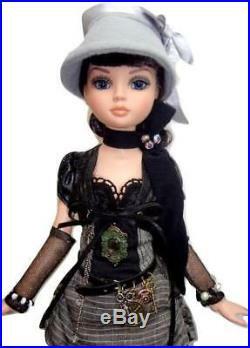 2014 Just in Time Ellowyne Wilde dressed fashion doll from. 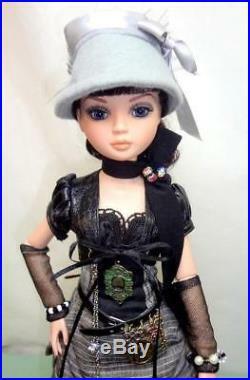 Has been re-dressed in a OOAK steampunk fashion ensemble. Made of fine quality vinyl and hard plastic with numerous points of articulation for fun posing, Ellowyne has inset blue eyes behind thick lashes and full-rooted mane of mink hair. Her One-of-a-kind steampunk ensemble includes. Fancy black corset from 2005 Basic Wicked Witch 16 doll by. 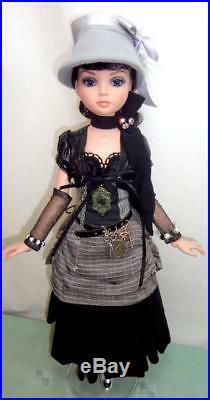 Black pantaloons from 2005 Basic Wicked Witch 16 doll by. Black full-length skirt with attached gray pinstripe overskirt. Matching gray-pinstripe and black laced corset decorated with framed jewel. Lined black gauntlets from Black as Night Parnilla Ghastly 19 doll by. Black leather belt with silver buckle and attached steampunk charms including silver scissors, antique gold pocketwatch, copper telephone, and antique gold skeleton key. Black shiny pleather short jacket with puffy sleeves, black tie ribbon, and attached silver cross charm with dangling chains with jeweled charms. Black chiffon neck tie decorated with jewels. 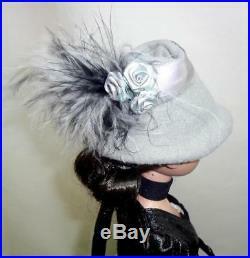 Silver-gray hat decorated with silver satin ribbon, silver satin roses, and silver, white, & black feathers. Metallic silver lace-up Victorian style boots. Beaded black and white stretch bracelet. White pearl and various black faceted beaded stretch bracelet. Reddy Giftware is dedicated to providing high quality service to our customers. Reddy Giftware is always willing to work with our customers to find a mutually beneficial solution when problems arise. Special exceptions to our policies, while not guaranteed, are likely to be granted if a customer communicates openly and honestly with us. We encourage you to look through our online stores for other items you may be interested in purchasing. Your modified invoice will include a comment indicating exactly what has been discounted. Please pay only the invoices with these comments to receive your discount. All sales are final. We will do our best to list as accurately as possible condition and contents of items up for sale. As an online provider of unique gifts, cultural items, and novelties from around the world, Reddy Giftware hopes to inspire an appreciation for cultural diversity and a passion for travel and discovery in the next generation. Imagine the empowerment this song provided to young ladies 3 decades ago. We highly encourage young ladies and men alike to take pride in their gender, stand fast in their beliefs, and never doubt their abilities to achieve. Get images that make Supersized seem small. Tailor your auctions with Auctiva’s. Track Page Views With. Auctiva’s FREE Counter. The item “Midnight Silver Steampunk Ellowyne Wilde Tonner 16 Doll in OOAK Fashion Outfit” is in sale since Saturday, January 20, 2018. This item is in the category “Dolls & Bears\Dolls\By Brand, Company, Character\Tonner\Ellowyne Wilde”. The seller is “scifieve” and is located in San Antonio, Texas. This item can be shipped worldwide.